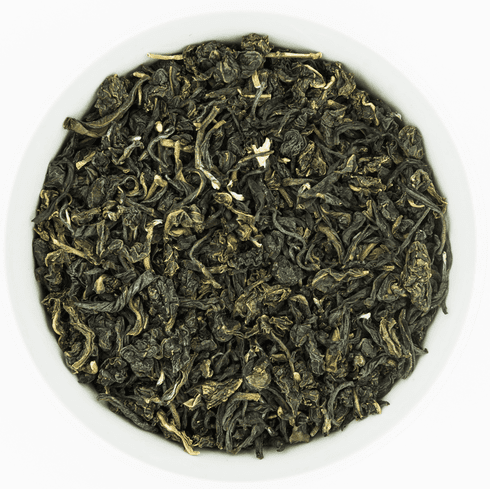 Ten Ren's First Grade Jasmine is a very high quality jasmine tea. This jasmine tea consists of green tea grown in Taiwan and is scented with jasmine petals multiple times. A typical grade of jasmine tea will be scented once. The green tea leaves used as the base are young as indicated by its small, slim leaves. The water used to steep this tea should be about 160-180�F or 70-80�C. Use about 2 teaspoons (3 grams) of tea leaves for about every 5 ounces (150 ml) of water. A steeping time of about 3-5 minutes with more or less time is recommended depending on the desired concentration. As a rough guide, the hotter the water or the greater the amount of leaves used, the shorter the steeping time should be. The use of a covered glass or ceramic cup is recommended for steeping in order to appreciate the tea leaves. Net tea weight is 4 ounces (113.4 g) and shipping weight is 0.28 lb.